Guns plus malls usually equal police, even for an 'open carry' proponent. An NBC Bay Area viewer sent us this photo of the incident. 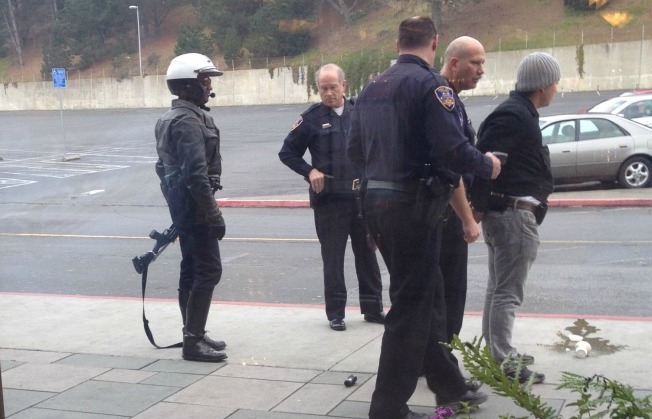 An "open carry" supporter with a shotgun on his back drew some police attention at a Daly City mall Monday morning. Around 9 a.m., police officers responded to the west side of the Serramonte Shopping Center after they got a report about the man, according to Sgt. Michael Barton of the Daly City Police Department. Police released the man after they discovered he was in legal possession of the shotgun, which was also unloaded. One of our viewers who was at the mall snapped the photo above.